I do not use a track in my training, whether I am training for a 10K or a marathon. In fact, I have never actually run a workout on a track. Maybe my splits would be faster on the track, thanks to its perfectly flat surface and springy energy return from the materials used, but I choose to run all my speed workouts on the roads for both convenience and personal preference. Maybe you are in a similar situation: you do not have access to a track, the track near you is reserved for high school sports practice, or you simply do not want to run around in 400m circles for your workout. Speed workouts will help you improve as a runner, but the good news is that you do not need a track to do speed work. There are alternatives – and not just the treadmill – for running speed workouts without a track. If you have convenient access to the track and enjoy using, go ahead and use it! The purpose of this post is not to dissuade you from using the track, but to provide options of how to do speed workouts without a track – whether access or preference is the issue. Originally, I did not use a track due to access. When I first started training for races and doing speedwork, the closest high school track was closed to the public. Sometimes, I ran my speed workouts on the treadmill, but since I had no idea what paces to run – just what effort to run – I preferred to run outside. Specificity: I race on the road, which means I try to do as much of my training as possible on the road. This is especially true if I am doing goal race pace workouts leading up to race: I want to know what pace I can hold on the slightly changing surface of the road. Freedom of schedule: At least in some areas, you can only run on a track during certain hours of the day and cannot do so when a sports team is in practice. Boredom: Since I run mostly marathons and half marathons, most of my repeats are in the range of 1K to 3 miles. 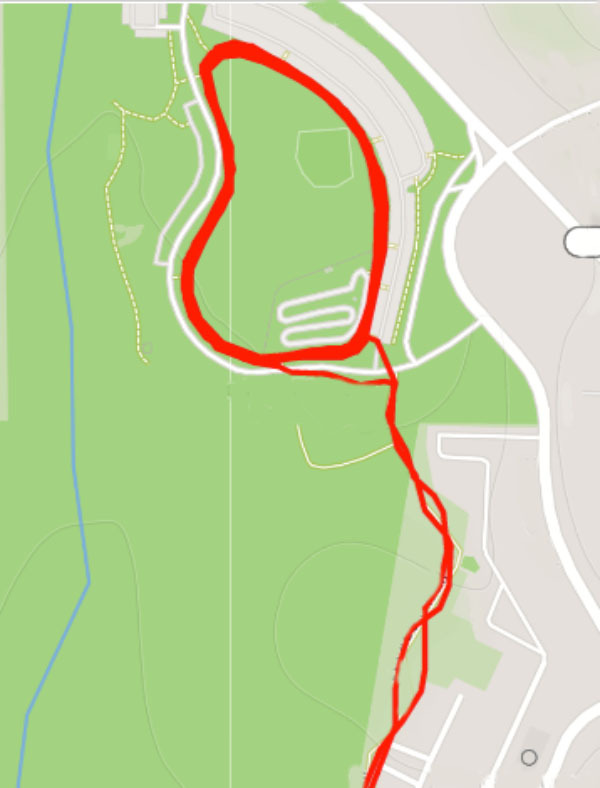 That equates to a lot of circles around a 400 meter track (and I would probably lose count! ).Workouts such as 2-mile repeats are mentally easier off the track because I only have to run a few laps around a paved loop or along a 2 mile stretch of road versus 8 loops around a track. Back in when I lived in Indiana, I ran all my speed workouts on a ¾ mile loop at the Old Fairgrounds Park. This loop was flat and wide enough to pass walkers. Since it was only a mile from our apartment, I could easily run there and back for my warm up and cooldown. Now, I run on a similar shorter paved loop. While not as flat as a track, this ½ mile loop is mostly flat and wide enough to pass walkers. It connects to a paved multi-use path, which makes warm-ups and cooldowns simple to include. Paved loops serve as great substitutes for tracks because they are uninterrupted, have no car or bicycle traffic, and can be easily divided into laps for speed workouts. Many of these loops are longer than the traditional 400m track, which means the degree in which you have to turn in less – and therefore, less uneven stress is applied to your legs. You can find paved loops around local parks, college campuses, and other places around town. For tempo runs or longer repeats, I use a long uninterrupted multi-use path. This path runs through a river valley, which means it is flat. Since the path goes for miles, I can do long repeats or continuous tempo runs on this path without circling repeatedly around a track. The best part about this path is that it mimics the terrain of most races in the area – 5Ks, 10Ks, and half marathons are commonly run on similar multi-use paths (if not this exact one). The slight variation of terrain, the energy return from the pavement, and having to account for wind makes it very similar to race day conditions. While a 7:00 minute mile on the track may not equate to that on the road come race day, a 7:00 minute mile on a paved path gives me a better idea of what I can expect to run on race day. More and more cities are building multi-use running and bike paths. Check out your local government’s recreation website, search on Strava for possible routes, or ask some local runners. If there’s nowhere flat and uninterrupted in your area, consider finding an uninterrupted stretch of road or path on a hill. You may not experience the same gratification of seeing fast paces as you do on the track or flat paths, but you will improve your speed and strength by running on the hills. 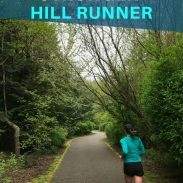 Try one of these hill workouts for runners. One benefit of running on the track is precise measurements. You know exactly how far 400 meters is – you do not have to rely on your GPS watch and worry about possible inaccuracies. Measuring precise distance on the road can be a little trickier. While GPS watches can be thrown off by tree cover or tall buildings, they do provide a high level of accuracy in measuring distance. 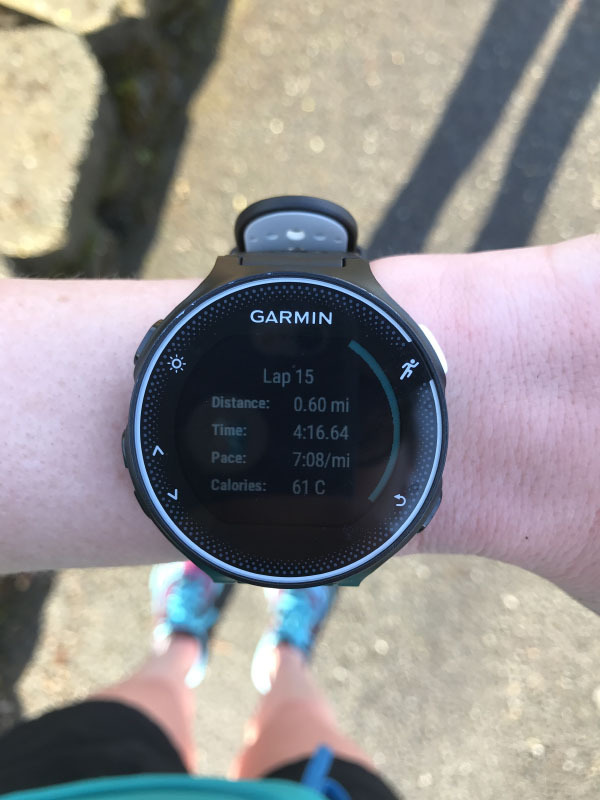 I run with a Garmin 230, which has the capability to write workouts on Garmin Connect to upload to the watch and program intervals (by time or distance) on the watch. I rely on this feature for intervals on the road – the watch will beep to signal the start and end of each interval and the screen will display the time remaining, distance covered, and my pace for that specific interval. If you do not have a Garmin, you can use the Runkeeper app to customize an interval workout by time or distance. If you are running by time and not distance, you can use a stopwatch or an interval timer app. If you look at my training logs, you will notice a propensity for fartlek workouts over distance-based intervals. Especially for shorter intervals, running by time is easier to measure than running by distance. You do not even need a fancy watch – a simple interval timer app on your phone or a stopwatch will work. I like doing intervals by time because they place the focus solely on effort. On the track, it is very easy to measure exactly how quickly I covered 400 meters; when on the roads, GPS lag can be slow enough that I do not know my exact pace until reviewing my data post-run. I am not worried about if I’m faster or slower than last week, I simply focus on my effort. Especially during marathon training, when the demands of the mileage and long runs tire out my legs more and more each week, this shift away from pace and onto effort keeps me from pushing too hard in a workout. It is quite simple to switch your workout from distance-based to time-based while still maintaining the same purpose. Take your planned track workout – say, 400 meter repeats – and approximate how long it would take you to cover those at the prescribed pace (such as 3K to 5K pace). You can use a pace calculator to simplify the math. Then, round it to the nearest :30 seconds or minute for ease – you do not need to be exact. Read this post on how to turn track workouts into fartleks for more guidance. For example, instead of doing 400m repeats on the track, I will run 2-minute repeats. 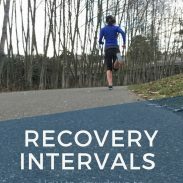 I cover more than 400 meters in these repeats, but the workout still achieves the same physiological purpose – there is nothing magical about running 400 meters instead of 500 meters. 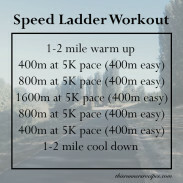 Do you run speed workouts on or off the track? During the winter/spring, when the track is covered in snow, I do my speed workouts on the road. We’ve got a couple of good options for flat and with minimal traffic. Of course, during the winter there’s always the snow/ice factor too. We also have a university nearby that you can sometimes sneak in to use the indoor track. But other than that, I don’t mind the track at all. It’s kind of fun to me now! Snow and ice really do throw speedwork for a loop in winter – that’s awesome that you have an indoor track to use during winter! That would certainly be preferable to the treadmill. 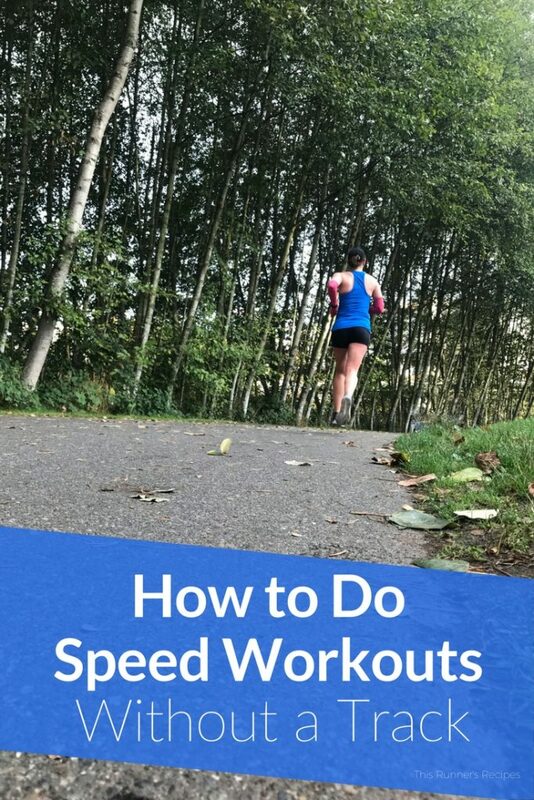 Ive done speed workouts on a track several times, especially in the beginning of my marathon training cycle a few years ago. Sometimes its nice to have a track so you don’t need to deal with traffic lights or hills. There is a street in my neighborhood that goes around a small field that I use for shorter intervals. Its not completely flat but works ok. Its less than 400 m so I end up making a lot of circles! But at least I can do my warm up and cool down around the rest of my neighborhood. The track does have the great advantage of no hills! It can be hard without a track if there’s lots of hills and no flat areas like waterfronts. The Garmin Interval training option or Workout option works really well – no having to stare at the watch since it buzzes! This is great! I also do not like to use the track. I have gotten hurt while trying to do formal speed work in the past. I do love to use hills as speed work and enjoy making my own speedier runs by running shorter faster segments with faster friends. Hills are excellent speedwork, especially if you are injury prone. Plus they strengthen the leg muscles a lot! Without track access this month, I have done most of my speedwork on the treadmill. A lot of this is also due to hot conditions here in SC- it feels more like August than October right now. We do have some bike paths but we also have a lot of construction near me, so even that’s not always super safe. I’ll throw out another recommendation for speedwork: Local races of shorter distances. One thing about 5K/10K races is that the course is closed. If you can mentally do it as a workout and hold back instead of racing, it is a great chance for a tempo run (and no, I’m not talking about failing at a race and then saying on Strava that it’s a tempo run… I know that happens haha). I’ve also used a half marathon as a long run before. Most are for charity so you’re supporting a good cause as well, although it can be a rather expensive way of doing speedwork! That’s a really good idea about 5K/10K races, especially if there’s nowhere safe/convenient to do speedwork during the week! I hope the heat breaks- you’ve had enough of the high temperatures and humidity! Really helpful, thanks! I had regular access to a track when I started running but it’s not as available any more and I switched to the treadmill for speed work. But I’ve been thinking about trying to take speedwork outside, especially for longer tempo runs. The paved trails near me tend to still be hilly but I may give it a try. I think you should give it a try! If you focus on effort, hills can be incorporated into speedwork. Plus, it helps you prepare for hilly races! We are super lucking in Chicago to live on a grid system and to have lots of flat, decently long straightaways. We would do repeats with our runners down by the lakefront when I was coaching with CES! I bet the lakefront views really make the repeats go by more quickly! Great tips! I actually love running at the track, but I agree that it doesn’t prepare you as well for race day- it’s a little too easy to run on. You’re definitely getting more benefit by only training on roads! These are awesome tips! I used to do sprints down a long avenue in NYC. I’d sprint down, walk back, sprint down, walk back, etc. People I passed probably thought I was crazy, but oh well! Thank you! Even if people think your crazy (and all us runners get those looks! ), if it works for speedwork, then it’s worth the stares! I used to meet my friend at the high school track to walk but I actually never run on the track. it’s possible I am still traumatized from high school when my gym teacher would force us to run a mile for the physical fitness tests and I fainted lol. one of my favorite stories ever. Now I feel much better about the fact that I don’t do speed workouts at the track. I have tried, but honestly they bore me to death since I’m constantly running in circles! These are really great tips! Great tips! I totally agree that the track can be limited in a lot of ways – I only have access to it when school is out and I am definitely not a fan of the circular motion of running.